While he continues to earn disapproval for it, the curse-laden expressiveness of President Rodrigo “Digong” Duterte is not without merits in the fields of branding and marketing. This, at least, was the observation Pompee La Viña, Duterte’s social media director during the last election. While occupying his previous post, La Viña was one of the people who monitored the current head of state’s performance during the polls. And now that all is said and done, now that his candidate stands above his opponents in the highest seat of the Philippine government, La Viña can now afford to look back, appreciative of his candidate’s often criticized behaviour. 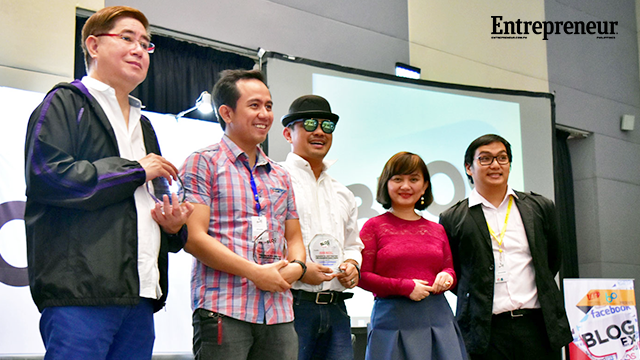 La Viña said this as one of the speakers for the recently concluded Blog Ex—an event put up by Brand Philosophy and Tag Media to recognize and advance blogging endeavours in the Philippines. 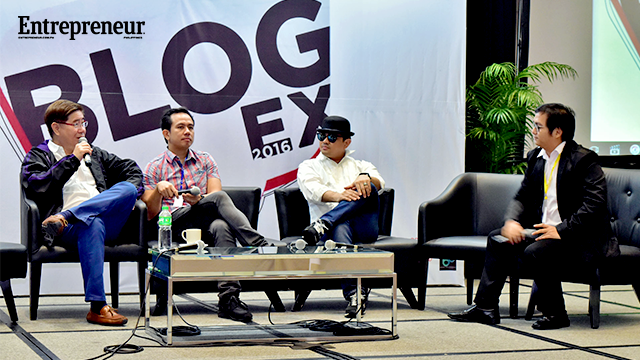 Featuring a number of online pundits, marketing professionals and content providers, the whole day expo served as a venue for La Viña to share the strategies behind the Duterte campaign. And at the heart of it all, according to him, was one simple fact: that the president had a solid brand and it was one that captured its intended market. This, of course isn’t the only reason, he said. And as he sat down for an exclusive interview with Entrepreneur Philippines, he explained that there are other strengths to the Duterte campaign that business owners might actually employ and benefit from. 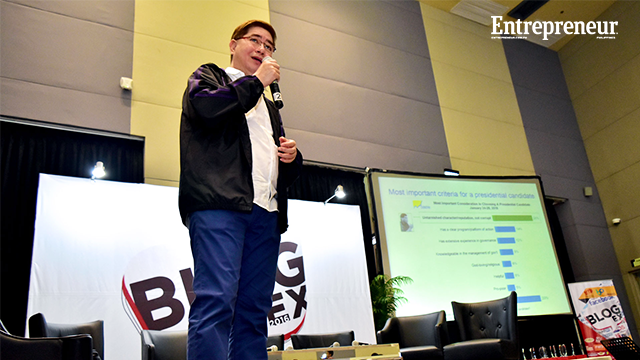 “That’s the most famous answer in business school,” he told Entrepreneur PH. “[The strategy] depends on your product. It depends on your target audience.” For the 2016 election, the product of course was the Duterte administration and the target audience was the Filipino people. So, in order to achieve its goals, the President’s campaign team took cues from a survey published by Pulse Asia Research Incorporated last February 19, 2016, a study which showed what the Filipino public was looking for in a president. “The highest is 28 percent: untarnished character and reputation,” he said. “Not corrupt.” And this, according to him, bode well for the then fledging Duterte campaign. “Then-mayor Duterte fit in that 28 percent so we emphasized on his lifestyle, his political will and his fearlessness,” he said. The campaign also focused on the president’s fiery stance against drugs and criminality. And while it wasn’t an issue most Filipinos considered pressing by December 2015, it did become a hot topic by January of the following year. “Did that happen by accident?” La Viña asked. People who have monitored the campaign period may think otherwise. After all, in nearly every clip, article or soundbite concerning him, Mr. Duterte made it clear that he will not stand for drugs and criminality in his administration. “I’ll dump all of you sa Manila Bay and fatten all the fish there,” La Viña said quoting his chosen candidate. And according to him, it was statements like these that made him compelling. Yes, when he hurled derogatory marks at the Pope, Duterte’s performance on the polls suffered because, as La Viña said, there are still a lot of Filipinos who were “afraid to go to hell.” But he also observed that there were a lot of Filipinos who were angry; citizens frustrated with the current state of the country. And the man that courted their votes, this fuming, verbally fearless presidential aspirant from Davao, matched their anger. His was a brand with a lot of potential. The only real problem was reaching a great deal of the public to promote it. According to La Viña, the Duterte campaign’s major problem was the lack of funds. “We didn’t have enough money to really advertise extensively on TV,” he said. So, like a lot of budding enterprises circumventing financial difficulties to fulfil its marketing goals, the Duterte campaign took to social media, particularly Facebook where it was supported by at least 12,000 volunteers. This proved to be the right decision given the figures La Viña showed. “Facebook matched the campaign because Facebook is an emotional venue,” he said. “In one day I could reach 270,000. These are engagements. Reactions, comments, shares.” He also praised the venue for allowing the campaign to be a nearly sleepless enterprise thanks mostly to the overseas volunteers who would often pick up the slack while local volunteers were having their downtime. “There were a lot of supporters on Facebook,” he said. And together with their supporters on both Twitter and Instagram, the campaign managed to net the aid of about 14,000 volunteers. “No agency can match their work,” he noted. And based on the results of the election, it appeared that no one did. Now that the Duterte campaign is over, La Viña believes that change has come. After all, this is the second successful campaign he supported within the last 6 years and during the first one—the campaign of former president Benigno Aquino III—the main strategies were different. His contributions for one included a 1,000-word piece he wrote for his chosen candidate. This is something he did not rely on during the Duterte campaign. “Nobody would’ve read them,” he said noting that people have become more interested in photos and videos. The video featuring Freddie Aguilar’s song, for instance, had 1.3 million views in less than 24 hours. Meanwhile, there were only about 400 people who would regularly engage his notes on Facebook. But this isn’t the only thing he noticed. “Six years ago, Risa Hontiveros had the highest likes or engagement [in social media. ]” he said, referring to the incumbent senator’s failed attempt at a senate seat in 2010. “She didn’t even win.” This year, however, La Viña said that people are attributing the current president’s win to aggressive efforts on social media. “Six years from now,” he concluded. “I’m sure it would be very different.” Highly specialized tools, he theorized, affect promotional efforts targeting specific demographics. These, he said, could be the major tools present in future elections. But even if such theories become facts, La Viña and people like him would still have to rely on certain things that don’t appear slated for change.